(272 x 334 mm) 11.7 x 16.5 in. 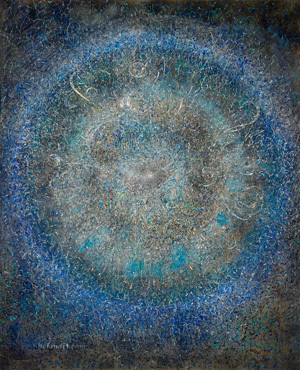 The Pulse of the Universe is the mandala that probably best conveys John's perception of the sheer majesty of our universe and his own conceptual expression of synaesthesia, for the orchestration of this painting can simultaneously evoke a symphony of the spheres in the soul of the viewer. On a metaphysical level this painting also evokes the cosmological pulse of the universe that theoretically still reverberates after the Big Bang, for the phenomenal amount of sensitive chaos that permeates the entire mandala resonates with the sublime intelligence of divinity. For many years this painting hung in our living room, and it was invariably the painting that our visitors usually gravitated to and remembered most of all.